Before Universal Search was part of Google, maps had started showing up in Google’s results. If you searched for a business name or category with some geographic information included in your query, you may have received a map in your search results alongside a business listing or listings that may have been relevant to your search. When a search engine attempts to respond to a conventional location search, it may look for the query to follow a fixed format, with a limited number of variations. For example, the search engine may look for certain words or terms in a pre-determined order (street name, state, zip code) and/or a pre-determined spellings. This may raise some difficulties in responding to searches, when people make spelling errors in those searches, or use alternative names for locations, and alternative address formats (such as those found in different countries). For location searches, many search engines will only return a single result in response, so it is important for them to be accurate, even when there might be uncertainty or ambiguity in the location search query used. A patent application from Google, recently published at the World Intellectual Property Organization (WIPO), addresses some issues with how location searches are performed. Determining which keywords to actually use for a search in response to a query may include doing such things as removing punctuation marks and non-location terms from the location search query. Synonyms for one or more terms in the location search query may also be used, as well as pre-determined abbreviations corresponding to the one or more terms. The process described also takes a look at whether to not a map should be shown within the search results, and how many business locations should be shown on that map. Sizes of geographic features corresponding to the key words. 1) A location search query, such as a street address in a city, may be received from a searcher. 3) This processing may include determining one or more key words in a respective location search query, removing punctuation marks and non-location terms (such as articles) from the location search query, and deciding upon one or more synonyms for one or more terms in the respective location search query. 4) Those synonyms may include predetermined abbreviations for and/or predetermined misspellings for terms in the query. 5) The canonical expression may be independent of the order of the key words, so a street address may not have to be in the order that you might ordinarily find one, such as: street number, street name, city, state, zip code. 6) The canonical expression could be compared to an index of geographic feature documents. Each geographical feature document has a set of tokens that correspond to a geographical feature, which may be a location (e.g., a street, city, country, state, country) or a geographical entity (e.g., lake, river, mountain, continent, ocean, etc.). 7) While a single geographical feature may correspond to a set of locations, such as a set of street addresses, all the locations associated with a geographical feature may be considered to be “a location” in the context of identifying the locations or geographical features that best match a location search query. 8) Location information and supplemental information may be found in the index . Location information may include key words, synonyms for the key words, and proximate objects for multiple locations. Supplemental information may include reference coordinates, such as latitude and longitude and/or a range or street numbers, for the locations. 9) Scores for a subset of the geographic feature documents that are a close match to a respective canonical expression may be returned, and the top-N geographic feature document may be ranked. 10) If a best score is more than a predetermined distance from a next best score, the location for the best score result may be presented to the searcher along with a map image of the corresponding location. The map image could be centered on the location and may be sized to include a pre-determined bounding box, region or window around the corresponding location. 11) Several locations may be shown to the searcher if the best score is less than the pre-determined multiple. 12) Such additional information as a location identifier (city, state, zip code and/or country) and/or links to corresponding map images, may be shown. I’ll be keeping an eye out for girl scouts the next time I’m in Miami. The patent filing doesn’t provide any insights into why they might show up number one for a search for gun shops there. But it does provide a lot of details about how a query might be rewritten, and when a map might be displayed for a location search query. I will make you a cool graphic for this post! Bill – what does that mean? In deciding which documents rank highest for a specific term or phrase, a number of decisions might be made based upon things such as how often the phrase is mentioned in the index, or on the actual size of the the geographic feature – so that a location that covers more actual ground might be chose over one that covers less. Someone includes “New York” in their search without the word “city” and this algorithm might lean towards the state because of its physical size – but that might be balanced against the frequency of results for the City, and results for the City might be shown because of popularity. A choice between a “San Antonio” listed in different States might result in showing the San Antonio in Texas because it is a larger city than a San Antonio in other states. I was pretty surprised to see the girl scouts result at the top of the search for gunshops. It really was completely unexpected. Appreciate the link to the article from the Injury Free Coalition for Kids. It’s really encouraging to see people making an effort to make things better. Funny, but you made me curious enough that I had to track down an article about girl scouts and guns in Miami, Florida. I didnâ€™t think youâ€™d mind if I dropped a link to the “http://www.jhsmiami.org/violence.cfm?id=8434” Injury Free Coalition for Kids (server problems on the site) since itâ€™s for a good cause. What surprises me is that this is an old article from 2002. Q: Beyond collecting firearm data and giving out gun locks, the partnership also is an umbrella group that brings together various youth and violence-prevention agencies to help each other. A: Right. Agencies want to collaborate. They can’t do everything, and it’s better to address these problems in a multifocused way. So that’s really the purpose of getting the coalition together. For example, the Girl Scouts needed training on curriculum development [about nonviolence and other pro- social activities] and they also wanted a website. We’re developing the website. The Peace Education Foundation has a curriculum they want to disseminate. The result for girl scouts is so extraordinarily wierd and so thoroughly inappropriate it questions exactly how the G maps ranking system works. The G maps insert ranks the girl scouts first, tropic treades 2nd and natl gun 3rd. Go to the full summary of all gun shops ranked in G maps and tropic trades is 1st, Pantera guns 2nd, Ace’s 3rd, and the girl scouts 4th. A little wierd–in switching rankings for gun stores. Click on the Girl Scouts link–and it takes you to the BOY SCOUTS web site. 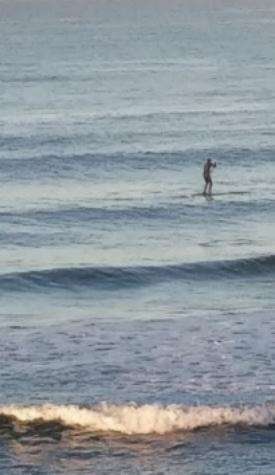 very wierd. Could it be that the document to which refers is the dominant document that G Maps referenced w/regard to gun shops and Miami Florida? Finally I performed the search both directly off of google maps and organic google. Within organic search and underneath the maps insert were a series of websites; none of which directly related to a gun shop in Miami. There were directories, lists, a YP version, some other references. Not a single gun shop web site within the first 6-7 web pages ranked within organic serps. I don’t know if that phrase is popular or not….but one gun shop in miami could get strong ranking and visibility if the site was optimized. I think a lot of testing of a lot of g maps categories to determine where and how G uses characteristics of sites, addresses, etc to determine how a site ranks w/in G Maps. (btw: If we ever travel to Miami at the same time, happen to be there for a convention, whatever–I will definitely not piss you off–in fact I’ll just keep my distance!! I’m not sure what inspired that search, Dave. Maybe watching too many episodes of Miami Vice. It was the first search that I performed for this post, and the results were odd enough that I decided to include it here. The transformation of “Florida” to “FL” was what I was aiming at, but the girl scout result made things interesting, and I was hoping that someone might provide some thoughts upon it. It definitely bears some more investigation. Some period ago Mike Blumenthal’s blog on G Maps and Y Local noted that G Maps was shortening phrases while maintaining the logic; hence Miami Florida to Miami FL. It has been happening for a while. Christina’s reference to the reference to girl scouts really grabbed my attention w/regard to G Maps ranking of relevant sites. It would appear that the page/reference gave it high relevance relative to other sites–including sites that don’t have an actual web presence. I recall Mike’s post on the topic, and was happy to have found something that appears to describe that kind of behavior. The girl scout connection to that result is interesting and I will be looking at it some more. I took a look at the results of that search too. Look at the address and phone numbers on the Tropical Trades and the Girl Scouts listings. They are the same. A search on the address in Google [“9696 SW 40th St, Miami”] shows multiple results, with possibly a youth organization center where cub scouts meet, and one or more sporting goods/camping/recreational goods shops. The Google Street View of the address isn’t clear enough to make out what business or businesses are actually there. But this issue with the Girl Scouts appears to be one where the decision on which authoritative document for that location is messed up. It does appear that there is a gun shop at the address, but it likely isn’t related to the Girl Scouts. That’s a really good question. That may be part of why they would prefer using the abbreviation for a state instead of the full name, because either should work fine. They are taking another approach to the problem – instead of promoting shorthand versions of words, they try to predict what you are writing in a search box, and provide that to you as a choice in a dropdown box directly under the search box. You can see this in action in the Google toolbar search box. If you start typing in the word “Coffee” you may see a number of suggestions that are somehow related to the word that they think you might be typing. It can save you keystrokes, and make it faster to find what you are looking for. Yahoo is doing this too, on their homepage – try typing in “coffee” at Yahoo, and you’ll see a list of suggestions after you’ve typed about three letters. Yahoo first tried out predictive queries over at alltheweb.com. Ask.com does the same thing, too. Is Google preparing for more handheld searches by shortening words that can be shortened due to the smaller screen sizes on mobile devices? It would make sense. Could they also someday develop and promote shorthand versions of words that already exist and approve them for mobile device use? Kind of like speed writing? Example: knd of lik sped writn? It would save screen space, and teenagers who text message a lot already have such a system. Then we could all write “Google Gobble on the Go.” Now that would be power…corporations re-creating languages. But as teens know, it works, it’s fast, it’s brief, and it’s easy. What’s really odd is that when I did that search at maps.google.com, the girl scout result was coming up number 4 instead of number 1. When I search for [gun shop Miami Florida] at maps.google.com, it comes up number three. When I search for [gun shop Miami Fl], the girl scout result comes up number three. Why would it change positions from 4 to 3 if the abbreviation “FL” is used for Florida in the query? 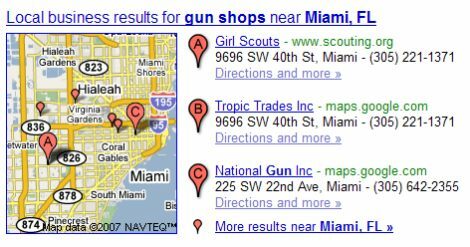 As of 08/09 I’m seeing the Girl Scouts ranked 4th for the Gun shops/Miami Florida query in G maps. I wonder if they got a bad review? I’m baffled as to how G Maps ranks businesses according to variations on keyword phrases. Change a word or two and G Maps changes the rankings. I have a better feel for it w/in organic G but not w/G Maps. I think it needs lots of testing. I have yet to get a feel for this from my own testing and I don’t see commentary on this. I think we need wide testing and feedback to get a sense of how this is working. Local Business Results is a beta product in the live environment. Location within an area also plays a role here. The [gun shop miami florida] results are looking pretty good now. So are the [guns miami florida] results. A search for [girl scouts miami florida] has a top result of scouting.org, which is a boy scouts site, that still hasn’t quite gotten resolved. here it is several days later…and I can’t find the girl scouts in any listing w/in a ranking from G Maps off of the onebox. I went 50 or 60 deep with a variety of terms with Miami, Florida, or Fl and gun shop or gun shops. BTW: I did note that seobythesea ranks 15th in organic search for a phrase like gun shop in Miami. It appears that google either manually, or based on an algo removed the reference. Actually Bill the search, the discovery, and the commentary is fascinating on many levels. It just so happened that beyond your original points there were other compelling points about Google Maps. Christina’s catch on the possible source documents that may have caused the scouts site to show in Google Maps moved the commentary into an entirely different area….but one that is also worthwhile to investigate. The subsequent reduced ranking then removal of the scouts site brings up still other mysterious issues. Why were you searching for guns, Bill? Anyway, this is funny stuff. How could the search algorithm arrive with these results? I started searching different local listings until I came across one where there was a result that really puzzled me. I ruled out searches that might provide too many results in an area, such as pizza places or lawyers or plumbers. I’m not quite sure how the girl scouts ended up at the top of that search, and I haven’t been contacted by anyone from Google who might explain it either.